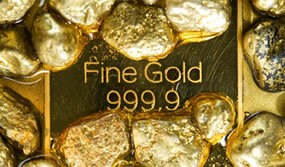 Gold futures climbed on Friday for the first time in four sessions and eked out a weekly gain. Gold for June delivery tacked on $21.70, or 1.7%, to settle at $1,294 an ounce on the Comex division of the New York Mercantile Exchange. The level was just off from Monday when the yellow metal rallied to a 15-month high at $1,295.80 an ounce. A weaker-than-expected U.S. jobs report supported safe-havens like gold, opined analysts. The Labor Department said the U.S. economy added 160,000 jobs in April, well below consensus expectations of about 200,000. "The jobs number was a devastating blow to the people who believe that a June rate hike is on the table," Bloomberg News quoted Phil Streible, a senior market strategist at RJO Futures in Chicago. "Now the chances have declined significantly, and as a result gold and silver are moving up and should move through their previous highs." Gold futures edged up 0.3% on the week, their second consecutive weekly gain after soaring 4.9% last week, and they are 22.1% above their final close in 2015. "This week, 660 people participated in Kitco’s online gold survey. Of those, 418 voters, or 63%, said they expect to see higher prices next week; at the same time, 159 people, or 24%, said they expect to see lower prices next week; and 83 people, or 13%, are neutral on the market. Out of 35 market professionals contacted, 16 responded, of which nine, or 56%, said they are bullish on gold. Meanwhile, five experts, or 31%, said they are bearish and two (13%) were neutral. Market participants include bullion dealers, investment banks, futures traders and technical-chart analysts." Rising for a second day after falling for three in row, silver for July delivery added 20 cents, or 1.2%, to settle at $17.527 an ounce — the highest since a week ago Friday when the white metal scored its own 15-month high at $17.819 an ounce. Silver prices slipped 1.6% since then but they are still 27% higher on the year to date. July platinum added $21.30, or 2%, to $1,085.10 an ounce, and moved up 0.6% from a week ago. Palladium for June delivery gained $6.50, or 1.1%, to $607.20 an ounce, but tumbled 3.3% on the week. For the year so far, platinum is 21.5% higher while palladium is up 8%. Gold added $8.75, or 0.7%, to $1,289 an ounce. Silver declined 7 cents, or 0.4%, to $17.31 an ounce. Platinum added $8, or 0.8%, to $1,072 an ounce. Palladium declined $3, or 0.5%, to $604 an ounce. For the week, gold and platinum logged gains of 0.3% and 0.7% while silver and palladium fell by 3% and 3.8%. U.S. Mint gold sales climbed by 20,000 ounces this week compared to last week’s total of 21,500 ounces. The weekly sales splits include 13,500 ounces in American Gold Eagles compared to 18,000 ounces previously, and 6,500 ounces in American Gold Buffalo compared to 3,500 ounces previously. The U.S. Mint limited this week’s sales of American Silver Eagles to 1,085,500 coins, which included 85,500 coins carried over from last week’s supply of 1,087,500 coins. Distributors ordered all of them by Friday. 2016 Silver Eagles are at a record sales pace of 20 million coins, representing a 27.3% increase over the same stretch of time in record-breaking year 2015. The 105,000 sales quantity for the Shawnee 5 oz. silver bullion coins is MUCH higher than previous issues. Previous issues, therefore, had a numismatic value. To maximize their profits, the U.S. Mint always seems to ruin things for collectors. Don’t buy the bullion coins unless you can get them close to spot silver price. If you are a collector then the reasonable price shouldn’t matter. You are either a collector or an investor. You decide. Just my thought. I, for one, just buy the “P” mint coins for their beauty. By the 1985 law that created the silver & gold American Eagle bullion coin program, the Mint has to produce all its current bullion version coins to meet public demand as dictated by how many bullion coins are ordered by the Mint’s 13 worldwide bullion coin Authorized Purchasers. That is why there was no 2009 Proof silver American Eagle coin. The numismatic collector version coins come second place to the investor bullion versions. Strange, but true. Planchet shortages are part of the meet demand equation. Some of the 2011 ATB 5-oz bullion version pucks like Glacier & Gettysburg had the very high mintages of 126,700 each sold that year, the highest mintage of bullion version ones so far. You can buy them raw for around $95 now. The U.S. Mint is gearing up for its newest coin for 2016 – a $25 palladium bullion coin with 1-oz of .9995 fine palladium as per the 2010 Public Law updated in December 2015. The Mint is securing government contracts for palladium metal ingots & blank planchets. The obverse will feature Weinman’s “Mercury” dime obverse from 1916 & a reverse with an eagle he designed in 1906 for a private society award medal. With all the special coins on its plate this year it will be interesting to see if the Mint can get it done for this year! @Seth, I believe the reason for the extremely high sales of the 2011 ATB 5-oz Glacier & Gettysburg bullion coins was because of the low mintages and high popularity of the 2010 (first year) ATB 5-oz coins. Having missed the boat on those, many investors and speculators jumped on the next two 5-oz coins – which happened to be Glacier & Gettysburg. IMHO, there is something pretty funny about these having a face-value of $0.25. You are exactly right. Also, on the first day of issue of the first 5-oz puck in 2010, silver hit $48.88 per ounce that day as I was watching CNBC business news at noon & ordering my Hot Springs pucks from the Mint. Silver was lower when the 2011 coins were offered. It is funny to see a quarter dollar coin that is 3-inches in diameter, but the federal law that created the ATB pucks required the same denomination as tbe regular quarters in the ATB program. It is interesting that the largest size U.S. Mint coin in history is a 25- cent coin!